Breakfast is called so because it breaks a night-long fast. It is the most important meal of the day, because we have not eaten anything overnight, for around 10-12 hours, and in the morning we need to replenish our body’s energy and nutrient reserves, to gear up for the new day! Most of us agree with the fact that breakfast is an absolute necessity, no negotiation whatsoever. However, in the dizzying hurry that we all are in, so many of us head out without having our breakfast. Just a cup of coffee or tea and we are off. This is an absolute no-no! Even if you got up late, were too busy or simply feeling lazy, there is no acceptable excuse for not having breakfast. That said, we cannot deny the fact that mornings are the busiest part of the day and most of us hardly have time. 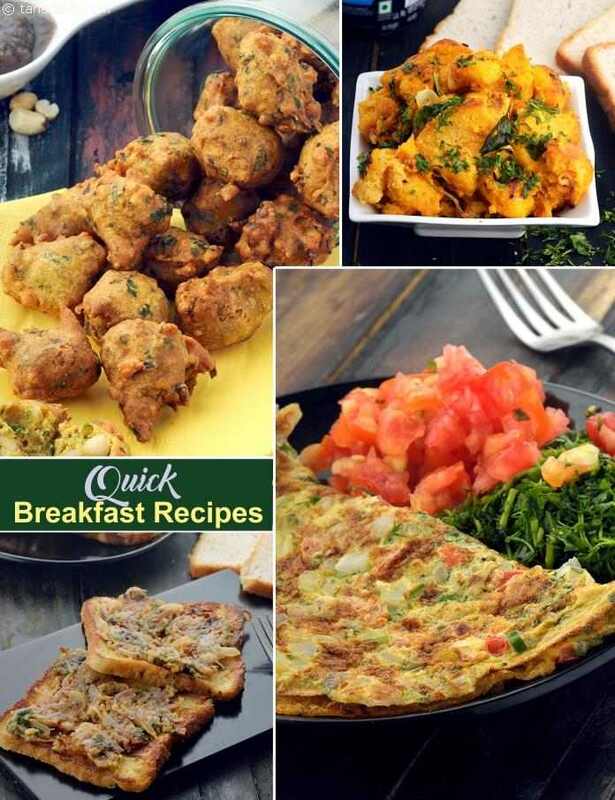 So, we have come up with a selection of quick and easy breakfast recipes, which you can make even when you are too busy. There are loads of options for those who have their breakfast at home, and some choices even for those who eat it on-the-go or carry it to office in a dabba. 1. Plan your breakfast the previous day, so that you can keep the ingredients ready to save time in the morning. 2. Planning ahead also increases the options you have, because you will have time to soak, grind or ferment batters. 3. Choose recipes that use ingredients available at home or at least easily available in local shops. 4. During the weekend, make a list of 7 items that you can make for the 7 days of the week so that you do not have to waste time every day on deciding the menu. This will also help you to finish your ingredients shopping at one go. 5. Theplas can be made in advance and used for 2 to 3 days. There are also some dishes like Aloo Paratha that can be prepared and stored in the deep-freezer, to cook and serve easily in the mornings. 6. You can also prepare and deep-freeze some common ingredients like mashed potatoes. 7. You can also prepare accompaniments like chutneys when you find time in the weekend and refrigerate them, to save time on weekdays. Once you have decided on the week-long menu, the next step is to do your ingredient shopping. Then, each night, look at what you have planned for the next day, and keep everything ready, so that in the morning you can start cooking right away without bothering about dough and batters! Here are some specific pointers, on how to plan ahead for foods like paratha, upma, etc. Never skip breakfast because you need to get to work early. Make one of these no-fuss, super quick breakfast recipes and carry them along to have at your workplace or on-the-go. • Make the dough at night and keep it ready in fridge. • If the recipe uses potatoes, boil them, cool and store in the fridge. • If you are taking the parathas along to eat later, then keep the packing materials ready. You can even pack the chutney or curds in the respective containers and stow them into the fridge, so that you can just pop them into your bag in the morning. • Make coconut chutney, coriander chutney or tomato chutney the previous night and store in the fridge. Take it out first thing in the morning so that it will be at room temperature when you eat. • If you are making sambhar, pressure-cook the dal and keep it in the fridge the previous night itself. If you are really hard-pressed for time, then you can even make the sambhar the previous night and refrigerate. Heat and serve in the morning. • Chop the veggies and keep them ready. • You can roast the rava, cool it and store in an airtight container. If you are dry-roasting the rava, you can store it at room temperature, else if you have roasted with oil or ghee, store it in the fridge. • If the recipe uses potatoes, boil them and store in the fridge. • Kanda Poha, Tomato Poha and Batata Poha are very easy and can be made in a jiffy in the morning. If you are eating breakfast at home, you have a comparatively larger choice of quick-fix breakfasts compared to those who carry it in a dabba. So, here are some of our Indian favourite breakfast options. They are easy and fast, and generally use only common ingredients. When you are in a real rush, you can have one of these satiating smoothies for breakfast. You can also couple your breakfast dish with a juice to make it a power-packed meal! Armed with these recipes, and many more available on our website, we are sure you never have to go hungry in the morning again. Remember, breakfast is a must. It must become a non-negotiable routine, which we do not even dream of skipping!